We have visited with a lot of people on our journey – old friends and new. Our reunion with Richard, Kara, Chris and Rose, who we knew from Uganda, had been in the works for a while. We stayed a few days in France with Allan and Diana, who we just met on the ship coming over. Paul and Wendy were fellow passengers on a bus in Peru and we spent a wonderful weekend with them in Scotland. We cheered our Uganda boss, Stephanie, and her dogs, Pip and Belle, on in their agility trials. We had dinner with Sandy and “Famous Author” in London. Nicole and Thaddeus were as nice to us as if we were really related. When we left Brett and Ashleigh in Germany, we were certain we had run out of people we knew in Europe. I thought of Mike, a guy we had lost touch with, when we were at the National Archeological Museum. He is a big fan of military history and I thought he would like to see a photo of spear tips and arrowheads from the battle of Thermopile. We no longer had his email address so I forwarded the photo to him through a mutual friend. Imagine our surprise when he emailed back that he had taken the very same photo that same day at the same museum! He and his wife, Jale, were on holiday in Greece. 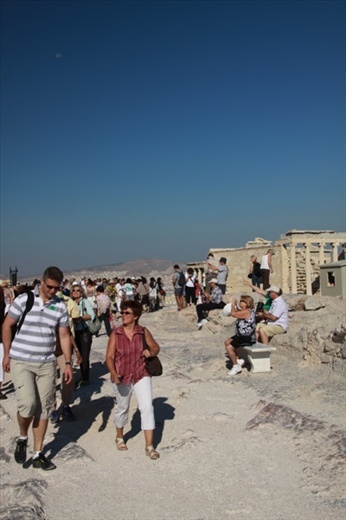 By the time we read his email we realized we were all at the Acropolis that very morning. Their tour schedule was pretty tight (that’s why we go it alone) but we managed to meet for a drink and a bit of reminiscing. Small world! So look around at those faces in the crowds. There may be people you know.